Spend a night on the town with local San Jose celebrities. 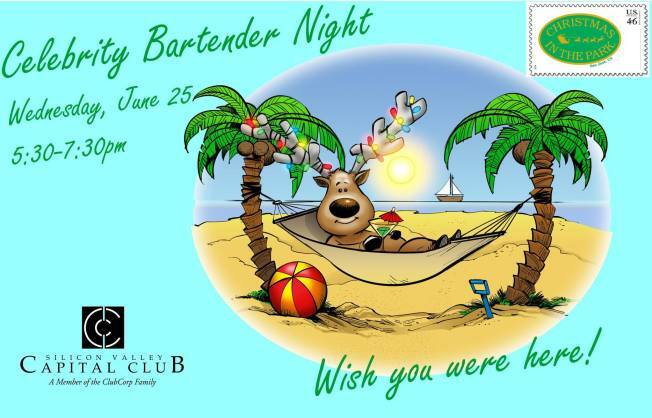 Silicon Valley Capital Club is generously hosting Christmas in the Park's Celebrity Bartender Night on the evening of Wednesday, June 25. Enjoy drinks made by Lissa Kreisler of 94.5 KBAY, former mayor Tom McEnery, Sal Pizzaro of the Mercury News, and more. Admission is free when you RSVP prior to the event. $1500: Christmas Tree at Christmas in the Park, personal visit by Santa Claus, two tickets to CITP event of your choice. $1000: Christmas Tree in Christmas in the Park, two tickets to CITP event of your choice. $55: Two tickets to CITP of your choice. $250: CITP Sweatshirt and Hot Cocoa Mug. $100: CITP Hot Cocoa Mug and Ornament. Cost: Free admission with RSVP, Free parking after 5:30 p.m.